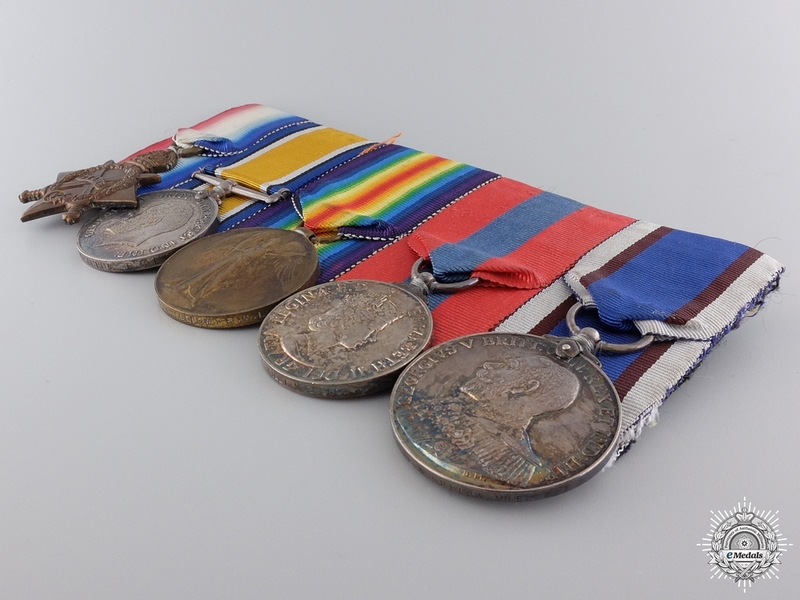 A WWI Group to the Royal Marine Light Infantry; 6th Battleship Squadron - 1914-15 Star (CH. 17552, PTE. G.W. SUDLOW, R.M.L.I. 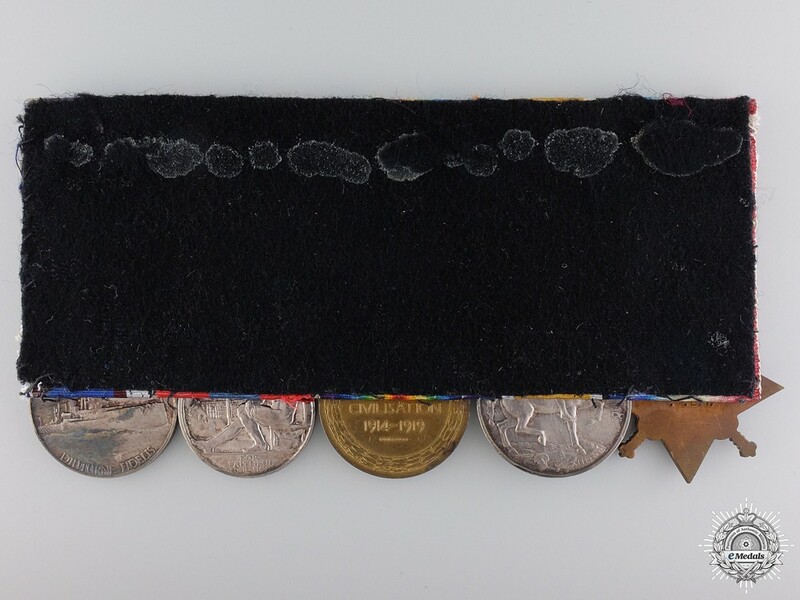 ); British War Medal (CH. 17552 PTE. G.W. SUDLOW. R.M.L.I. 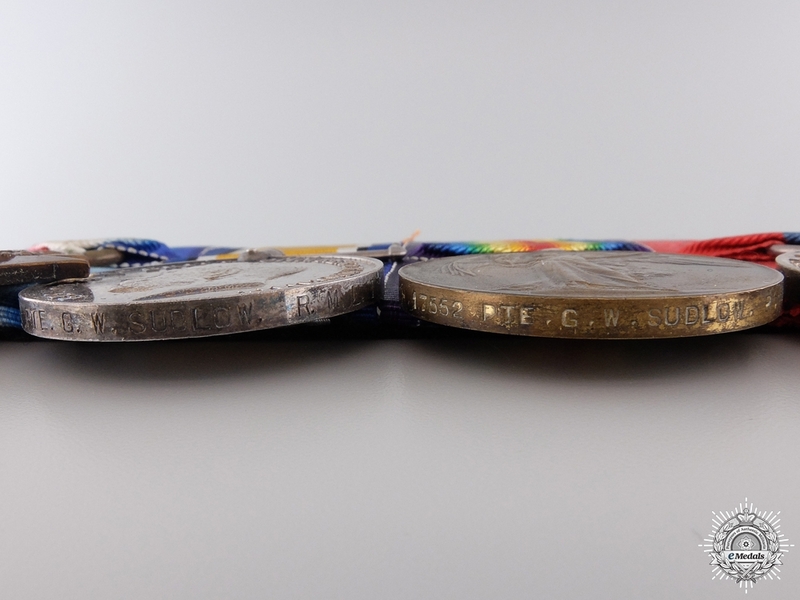 ); Victory Medal (CH. 17552 PTE. G.W. SUDLOW. R.M.L.I. 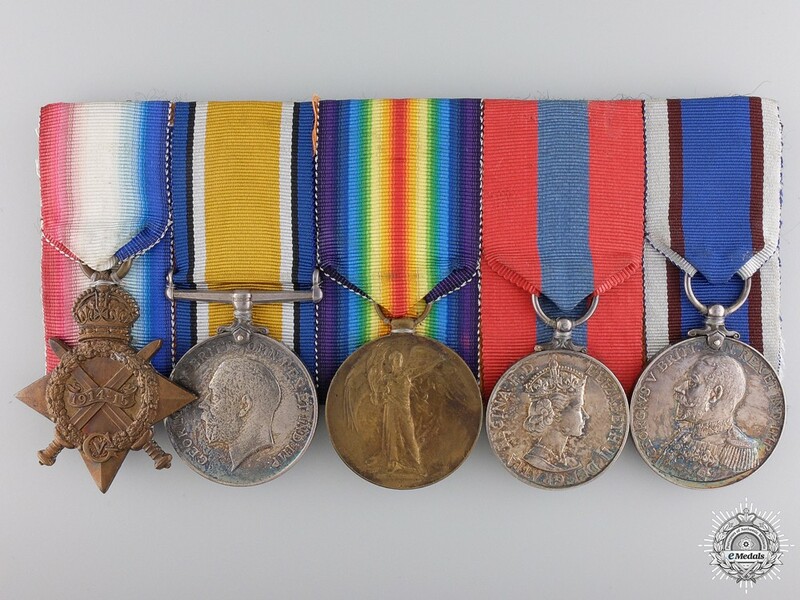 ); Imperial Service Medal, ERII (GEORGE WILLIAM SUDLOW); and Royal Fleet Reserve Long Service and Good Conduct Medal (CH. 17552 (B. 3014) G.W. SUDLOW. MNE. R.F.R.). Naming is officially impressed. 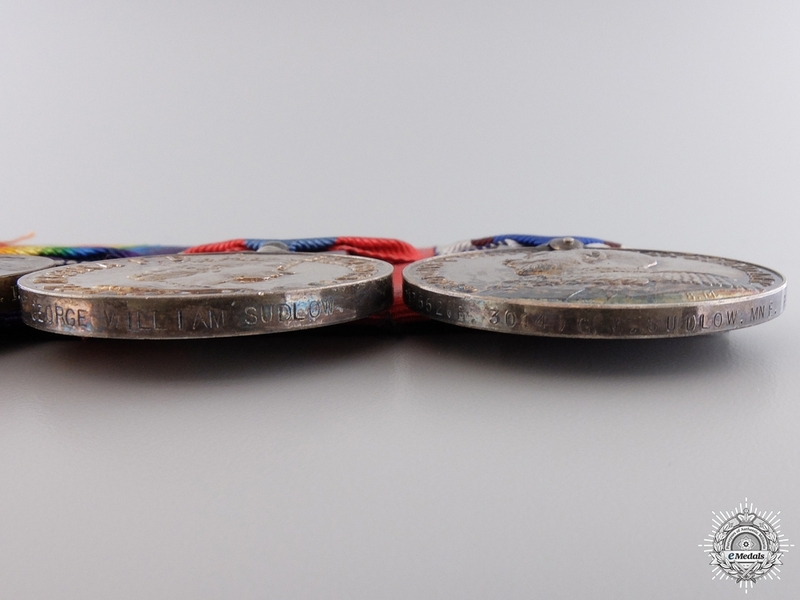 Court-mounted, dark patinas on the silver medals, contact marks and surface wear, very fine. Accompanied by a duotang folder with his military biography, a copy of his Service Records and nine black and white ship photographs. Footnote: George William Sudlow was born September 21, 1898 in Bradley, Cheshire. He enlisted for twelve years' service, with the Royal Marines at the Recruiting Depot in Birmingham, on September 2, 1912, three weeks shy of his fourteenth birthday, naming his next-of-kin as his uncle, Arthur Wooley of Ightfield, Whitchurch, Shropshire and stating his occupation as that of Farm Labourer. He was posted to the Royal Marine Light Infantry Depot at H.M.S. Chatham on June 12, 1913. He began regular service with the Battleship H.M.S. Russell, as part of the 6th Battleship Squadron serving in the Nore, located at the mouth of the Thames Estuary, on November 20, 1913 and continued to serve with her in the early years of the First World War. He returned to H.M.S. Chatham on June 16, 1915, one of many postings he would see there over his naval career. He was drafted to Submarine Depot Ship H.M.S. Bonaventure, on November 12, 1915, serving almost two years, before returning to H.M.S. Chatham on October 26, 1917. Sudlow finished out his war service on the River Class Gunboat H.M.S. Humber in the Mediterranean, beginning on March 4, 1918, before returning to H.M.S. Chatham on April 28, 1919. 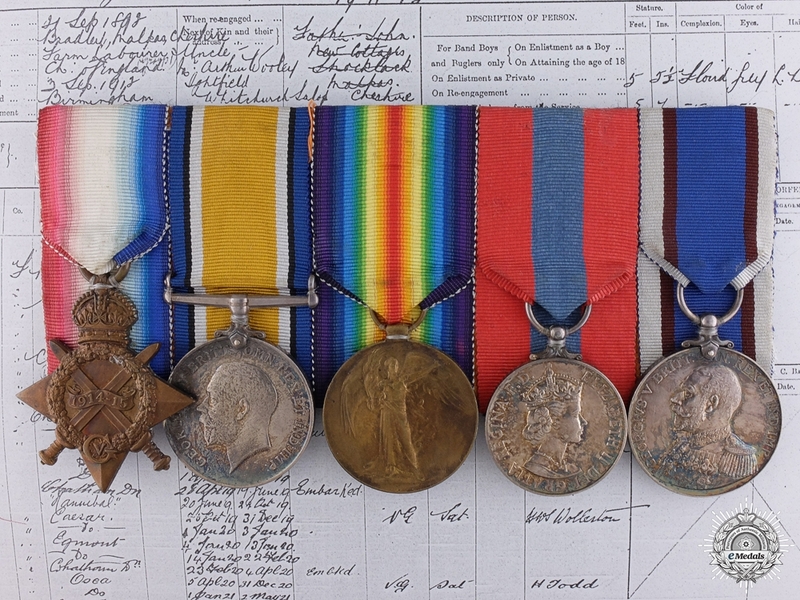 For his First World War service, Sudlow was awarded the 1914-15 Star, the British War Medal and the Victory Medal. Post-War, he was posted to the Battleship H.M.S. Hannibal on June 20, 1919, followed by a transfer to the Battleship H.M.S. Caesar on October 25, 1919, then a posting to the Accommodation Ship H.M.S. Egmont on January 4, 1920. He returned to H.M.S. Chatham on February 23, 1920, then posted six weeks later to the Depot at Osea Island, Essex on April 5, 1920. After thirteen months at Osea Island, he once again returned to H.M.S. Chatham on May 3, 1921, before joining No. 11 Royal Marine Light Infantry Battalion on July 1, 1921. The Fall of 1921 saw Sudlow posted to the Battleship H.M.S. Ramillies on October 21, 1921, the posting lasting almost two years before his return to H.M.S. Chatham on September 21, 1923. He was drafted by the Cruiser H.M.S. Weymouth on October 23, 1923, then posted to H.M.S. Chatham on December 3, 1923, before being re-assigned to the Cruiser H.M.S. Caledon on December 28, 1923. He returned to H.M.S. Chatham on August 15, 1924, where he finished his Royal Marine Light Infantry career. When his term of enlistment expired in 1924, Sudlow joined the Royal Naval Fleet Reserve on September 3, 1924 for an additional eight years' service with the Chatham Division until September 20, 1932. After fifteen years' service, he was awarded the Royal Fleet Reserve Long Service and Good Conduct Medal. Upon his discharge from Active Service, Sudlow joined the Civil Service and was later awarded the Imperial Service Medal for twenty-five years' faithful service, then retired.